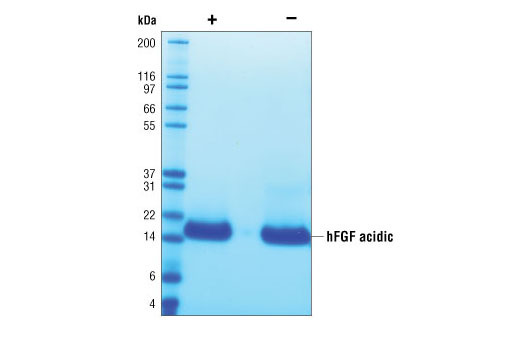 The purity of recombinant hFGF acidic was determined by SDS-PAGE of 6 µg reduced (+) and non-reduced (-) recombinant hFGF acidic and staining overnight with Coomassie Blue. The proliferation of NIH/3T3 cells treated with increasing concentrations of hFGF acidic was assessed in the presence of 10 µg/ml heparin. After 24 hr treatment, cells were labeled with BrdU for 4 hrs. BrdU incorporation was determined by ELISA and the OD450-OD690 was determined. 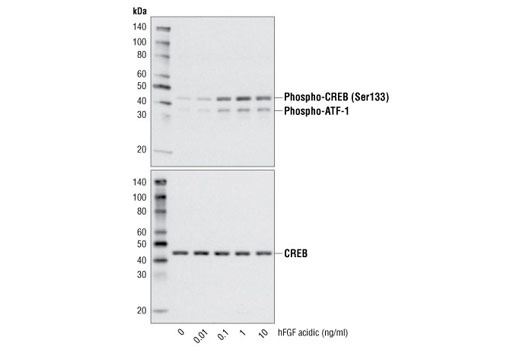 Western blot analysis of extracts from NIH/3T3 cells, untreated or treated with human FGF acidic for 10 minutes, using Phospho-CREB (Ser133) Antibody #9191 (upper) or CREB Antibody #9192 (lower). Recombinant human FGF acidic (hFGF acidic) Phe16-Asp155 (Accession #NP_000791) was produced in E.coli at Cell Signaling Technology. >98% as determined by SDS-PAGE of 6 μg reduced (+) and non-reduced (-) recombinant hFGF acidic. All lots are greater than 98% pure. Recombinant hFGF acidic does not have a Met on the amino terminus and has a calculated MW of 15,835. DTT-reduced and non-reduced protein migrate as 16 kDa polypeptides. The expected amino-terminal FNLPP of recombinant hFGF acidic was verified by amino acid sequencing. The bioactivity of recombinant hFGF acidic was determined in a NIH/3T3 cell proliferation assay. The ED50 of each lot is between 7-20 pg/ml. Less than 0.01 ng endotoxin/1 μg hFGF acidic. With carrier: Lyophilized from a 0.22 μm filtered solution of PBS, pH 7.2 containing 20 μg BSA per 1 μg hFGF acidic. Carrier free: Lyophilized from a 0.22 μm filtered solution of PBS, pH 7.2. Stable in lyophilized state at 4°C for 1 year after receipt. Sterile stock solutions reconstituted with carrier protein are stable at 4°C for 2 months and at -20°C for 6 months. Avoid repeated freeze-thaw cycles.Maintain sterility. Storage at -20°C should be in a manual defrost freezer. 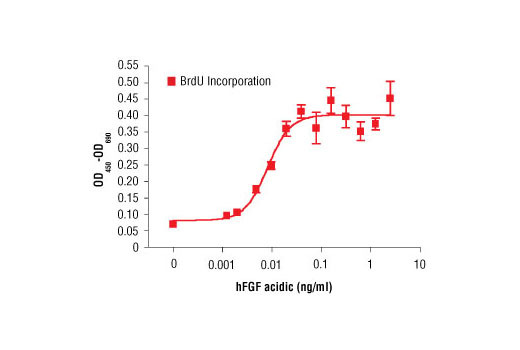 FGF acidic is a potent growth factor for fibroblasts and endothelial cells (1). FGF acidic is involved in wound repair, angiogenesis, and development (1). FGF acidic is secreted from cells via an endoplasmic reticulum/Golgi independent mechanism (1,2). The ability of FGF acidic to bind to heparin sulfate is required for its ability to interact with FGF receptors and induce signaling (1-4). There are four distinct FGF receptors and each has multiple splice variants (1,3). FGF acidic binds with high affinity to many, but not all, FGFRs (1). Signaling cascades activated through FGF basic binding to FGFR include the ras-raf-MAPK, PLCγ/PKC, and PI3K/Akt pathways (1). Powers, C.J. et al. (2000) Endocr Relat Cancer 7, 165-97. Prudovsky, I. et al. (2003) J Cell Sci 116, 4871-81. Ornitz, D.M. and Itoh, N. (2001) Genome Biol 2, REVIEWS3005. Mohammadi, M. et al. (2005) Curr Opin Struct Biol 15, 506-16. Sarabipour, S. and Hristova, K. (2016) Nat Commun 7, 10262.